Waveshare has extended their range of small e-papers with SPI interface. These e-paper displays are quite easy to use, and Waveshare has wiki pages for them with complete information, schematics, pdf specification, and code example. Be aware of the difference between e-papers and TFTs: update of e-papers is rather slow, ~1s, so they make sense for slowly changing information. E-paper display keep showing the information when powered off, and consume little power on update. The 1.54 and 2.13 inch Waveshare e-paper modules are also supported by my GxEPD library; they use the same e-paper displays (Dalian Good Display Inc.). Added support for 2.9 inch e-paper display to GxEPD (GxGDEH029A1) and more. Would you care to make your code compatible with the ESP32 as well? I just got my ESP-32, so this may happen after my short holidays. I'm user from germany, i try your scetch for 1.54 E-paper on wemos and it is running very well, but i will use a german-font. I am also interested in German fonts, but have no experience so far. Maybe you could ask for help in the German section of the Forum. Or wait for a response from an expert. 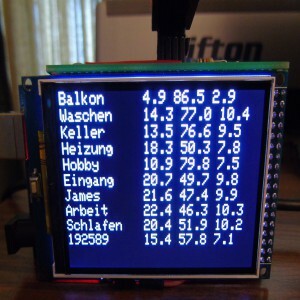 could you tell us more how to use 2.9inch Waveshare display with Arduino Nano/Uno. Let's leave 5V-3.3V voltage conversion issues. Please put some light how to talk to WaveShare e-papers from Arduino. One of the problems i found during compilation is that variable used to store screen resolution is uint8_t. 2.9inch screen has 296 x 128 pixels so 296 is greater that uint8_t can handle so overflow errors appeard. This is just one of the errors. I will look at this when I am back home. Just to be sure what you are referring to: GxEPD library or Waveshare library? I have not yet tried to use the Waveshare library, as I use Adafruit_GFX. But Arduino UNO has not enough RAM for full screen buffer, as used in my GxEPD. As far as I have looked into the Waveshare code, they use a smaller (line-) buffer for text output. I have decided that I will look at your problems as soon as your post is more specific, more clearly stated, and more correct. My code is generic as far as possible, with target processor specific default values for the constructor. The DESTM32-S2 connection board is NOT STM32 specific, but its pinout matches the DESTM32-S1 STM32 demo board from Good Display. Please state which uint8_t variable (name it!) you mean, and what other errors you refer to. Thank you ZinggJM for your answer. Loaded things up to Nano and my progress is e-paper screen was cleared (waveshare logo that was on screen when i bought it disappeared). No test text string was displayed. and so on. I seems Nano resets itself. I wonder why BUSY line on display module is low? In for loop that you can see that during first loop execution BUSY line is compared with EPD_BUSY_LEVEL, if its true "Busy is Low" is printed and the whole ReadBusy procedure is terminated with " return 1; ". Why this procedure returns 0 or 1 if it is not checked anywhere in the code whether 0 or 1 is returned? Then i modified main program loop to check BUSY line status: it is LOW all the time. Maybe there is sth wrong with my module? Please use code tags for code, "</>" at top left, it makes your post more pleasant to read. You do not provide any info concerning errors, so I forget about those. When you put data into PROGMEM, you need to read it with the corresponding read function; there are tutorials about this. The BUSY line is active when the controller takes time for commands, e.g. on update to display. I have not yet tried to use the Waveshare code; I may do this, but not with UNO or NANO to avoid the need for level converters or series resistors. I think any Arduino UNO or NANO user should have some of those ready at hand, or some other make. Yes, I did. I have updated GxEPD on GitHub. I could compile the Waveshare string example successfully for Arduino UNO and NANO. The waveshare array is referenced nowhere in the code, and therefore not included in the link process, at least with the actual Arduino IDE 1.8.3. Do you use an older version of Arduino, or have you done other changes to the code? I would just ignore your posts, but try to answer, so other users interested in these displays do not become insecure. I would like to use the "waveshare" 1.54 inch screen with an arduino MKR Zero, do you think this is possible? Are the changes to be made to your library important?